Cashel Bed and Breakfast is ideally located for touring around Tipperary. There are several Castles and monuments to visit around Tipperary County. Tipperary has several nature walks and trails to discover especially near Cashel. Why not spend a few days discovering the natural heritage of Tipperary. 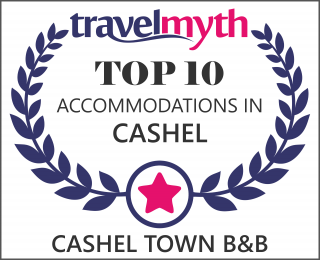 Let us help you to plan your trip to Cashel and the surrounding area. Why not start your visit to the Cashel Heritage Centre where you can pick up a map and information on Cashel (See an audio visual of Cashel from the 1640’s. Then visit the famous Rock of Cashel (Recently visited by HRM Elizabeth II), Dominic’s Abbey and Hore Abbey. Look out for the Sheela na Gig on the walls of the Rock!Have a relaxing lunch in one of our many great pubs or restaurants and spend the afternoon visiting Cahir Castle (10min drive from Cashel). From the Castle then walk along the river to the Swiss Cottage and see this magnicifant 200 year old cottage belonging to the Butler family. Fethard is a great place to visit, you can see the first class example of a Walled Town with Tower House. Check out the Sheela na Gig on the walls here also!Fethard is also famous race-horsing country, home to Coolmore Stud and High Chaparral and the Duke of Marmalade. Group visits can be arranged by prior appointment. OUT OF TOWN HERITAGE TRIPS. Lismore is a great place to go, travelling across the beautiful rugged landscape of the Vee where you may encounter an odd sheep or two, Lismore Castle and Gardens is a great place to visit. Do the Lady Gregory town walk and see the Millennium Garden. Visit the Lismore Heritage Centre and see the Robert Boyles exhibition.